Today has been a quiet day in that everyone has been bent over their laptops securing their data, and log sheets and writing their sections of the cruise reports. All except the underway samplers who have continued to sample until we left international waters. We are now transiting Irish waters, and will be until tomorrow when we will turn north up the Irish Sea to Glasgow. 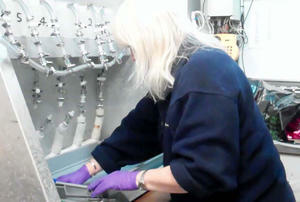 I haven’t previously mentioned Denise Smythe-Wright, who has been organising who-gets-what-water from the CTD casts. Occasionally the sample bottles do not fire, this calls for lots of last minute rearrangements of priorities as the samples are removed, and Denise seems to have sorted that out to everyone’s satisfaction. I was working on the website and new plots of the data coming from PAP1 most of the afternoon, but then the ship changed course slightly and we lost the satellite link, which is why this blog is a little late.